The newest segment of the Sleeping Bear Heritage Trail extends 3.8 miles from Port Oneida Road to Bohemian Road. In addition to hiking and biking, this section of trail offers numerous other recreation opportunities such as birdwatching at the Narada Lake boardwalk. The paved, non-motorized, multi-use trail will eventually span 27 miles from the northern end of Sleeping Bear Dunes National Lakeshore at County Road 651 to the Leelanau-Benzie County line at Manning Road south of Empire. 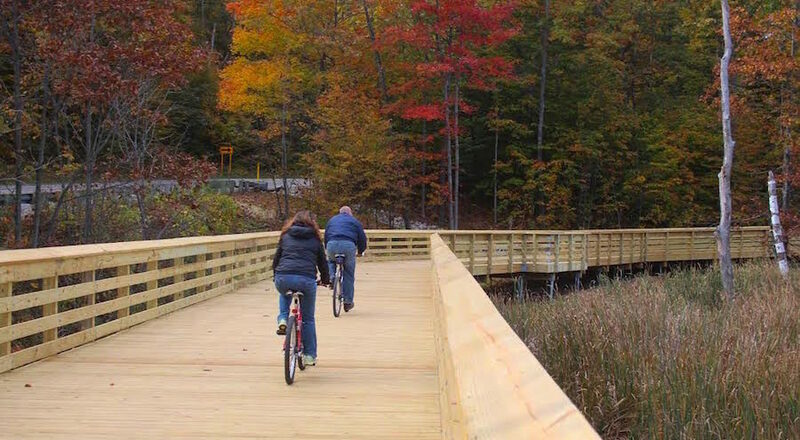 We checked in with Tom Ulrich, deputy superintendent of Sleeping Bear Dunes National Lakeshore, about what users will find along the recently completed trail section and nearby spots to explore. *Firearm season is November 15–30, wear hunter orange and avoid brown or white clothing. Of course, the Narada Lake boardwalk is being used by cyclists and walkers, but what other recreation opportunities does it offer? Cross-country skiing, snowshoeing, birdwatching, leaf peeping, running (local track and cross country teams use it a lot! ), even rollerblading! Tell us more about the birdwatching. And what other wildlife is in the area? Narada lake is beautiful. Loons and eagles use it frequently and have nests in the area. There are lots of waterfowl and songbirds. The lake has thriving beaver, frog and fish populations. What kind of feedback have you gotten from cyclists? They love the new section. Each segment we have added has its own charm and “personality.” This latest addition is a good mix of natural and historic scenery, straight and winding paths and it has all three surfaces—pavement, aggregate and boardwalk. Any nearby scenic spots, beaches, etc. where people should stop while riding the trail between Glen Arbor and Bohemian Road? This part of the trail traverses the Port Oneida Historic District. People should stop at the Olsen House where Preserve Historic Sleeping Bear has installed wonderful exhibits that tell the story of Port Oneida. There is a trailhead for the Sleeping Bear Heritage Trail with a small parking area and restroom at the Kelderhouse Farm on Port Oneida Road, just off M-22. Just north of the trailhead at the Crystal River is a stretch of boardwalk that crosses an interesting wetland. The new section of trail brings people to the doorstep of the North Unity School by Narada Lake which was very difficult to get to before. It is an easy ride down CR-669 to the Good Harbor Beach. How does the Sleeping Bear Heritage Trail stand out from other trails across the state? Unlike many others, it is not a “rails-to-trails” arrow-straight trail. That alone makes it one of the most pleasurable and interesting rides in the state. Beyond that, it connects local communities to some of the main attractions in a national park. That makes it stand out from others not just in the state, but across the country!